Universal tablet stand holds most 7.9" - 13" tablets, including iPad Air & mini! 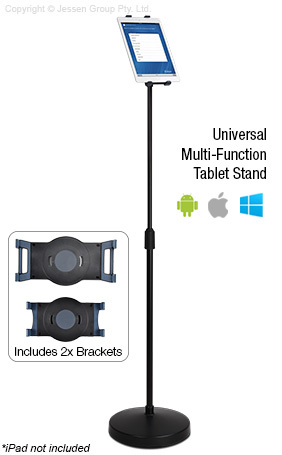 This universal tablet stand holds many sizes of tablets, including many iPad versions. The iPad mounts hold Apple® iPad Air, iPad mini, and most 7.9" - 13" tablets in portrait or landscape format. You can easily rotate in 360° without having to use a screwdriver for fast changes between orientations. The stand is made from aluminium with a black finish, providing a durable display that looks great in any setting. This Apple iPad stand, universal tablet stand is height adjustable as well, making it easy to change the height from 945 to 1470mm for use in different situations. The mount tilts as well to angle the screen for best viewing. The base of this iPad holder is weighted as well to keep the display stable and in place during use. Order today for hands free tablet use in your home or at your retail store, travel agency, exhibition hall, shopping centre, or restaurant!